Flooring is an important part of any building, as it adds the beauty and charm to every room and ultimately to your home. Tiles are the most commonly used material for flooring as they are very durable and available at cheaper price. Tile adhesive is a special type of glue used to fix tiles all around the home. Tile adhesive is a ready-made mixture made from Portland cement, polymers such as epoxy and selected aggregate particles with some additives added in it to improve its property for laying tiles. Tile adhesives are used for fixing tiles on the walls, floors, swimming pools, etc., which may have any type of substrate such as cement, wood, glass, etc. They are primarily based on cement, epoxy and polymer. Here we have tried to give a brief on the tile adhesive and its types, which a homeowner should know before laying tiles on your floor. Tile adhesive is a flexible material which does not shrink or crack due to moisture and temperature changes. Tile adhesive is used to prevent crazing and shedding of tiles. 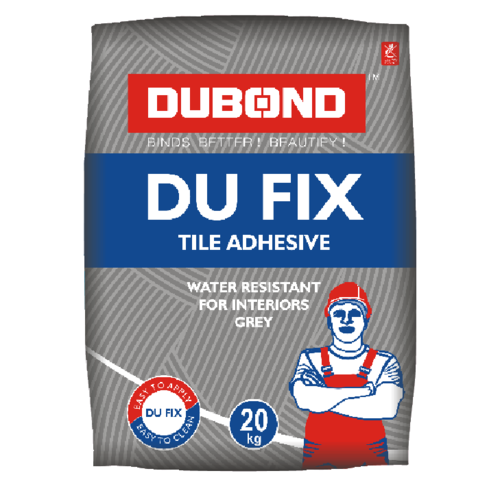 It is very easy to use a tile adhesive, as ready-made bags are available and only water is to be mixed. Pre-mixed tile adhesives are also now available in the market. They are also used to fix or prevent seeping of water underneath the tiles. Tile adhesive used for new tile flooring are generally polymer modified cement based tile adhesives which are available in powdered form and are mixed with water before application. They offer more strength as compared to normal cement-sand mortar. They also offer waterproof properties and can be used for application in wet areas i.e. bathrooms, kitchen, swimming pools etc. Various polymers such as acrylic, latex, epoxy, etc. are added for improving its adhesion properties. Acrylic makes tile adhesive moisture resistant. It is generally used for fixing tiles of small sizes. Ceramic tiles, vitrified tiles, natural stone tiles, etc. can be easily fixed by it. Latex makes tile adhesive more flexible. It is ideal for exterior use where some movement is required. Epoxy helps in increasing hardness and strength of adhesives. Epoxy modified adhesives may be used internally or externally as they are resistant to oils, water, dilutes acids, alkalis and most solvents. Epoxy is the most expensive and strongest tile adhesive. Epoxy modified adhesives has industrial applications, such as fixing tiles which are chemical and corrosion resistant. Nicotile CCL from Fosroc, Roff new construction Tile adhesive by Roff, Perma R-poxy by Perma, Latapoxy by MYKLaticrete, Pure by Dubond, etc. are the commonly used tile adhesives. Polymer modified tile adhesives which have non-skid properties are used for application on wall cladding. They are ready to use adhesives which are mixed with water before application. Ceramic as well as vitrified tiles can be applied using this adhesive. Roff stone tile adhesive by Roff, Sika Ceram Grey by Sika, Latifix 305 by MYKLaticrete, DU FIX by Dubond, etc. are commonly used products for this application. 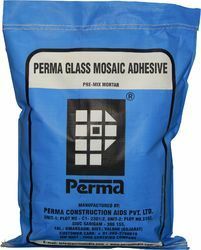 Special adhesives which have high strength are used to fix glass and mosaics. They can also be used to fix tiles in submerged areas such as in bathrooms, swimming pools, etc. 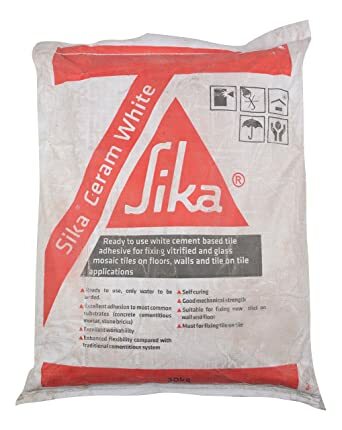 They are generally available in white coloured powder in bags of 5 kg to 25 kg. The white colour is due to addition of white cement. These are the most expensive adhesives. Roff glass tile adhesive by Roff, Nicotile GPX by Fosroc, Perma Glass Mosaic by Perma, Sika Ceram White by Sika, Power by Dubond etc. are commonly used products for this application. While renovating the old tile flooring, many homeowners prefer fixing new tiles on the existing tile flooring. For this purpose tile adhesive having non-skid and no shrinkage property is used. They are made by blending special polymers with cementitious mixture. 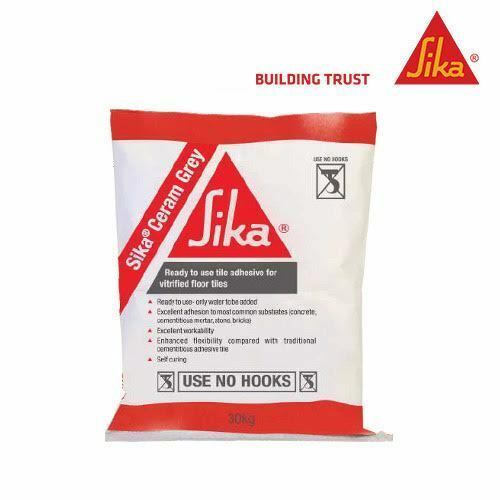 Roff non-skid tile adhesive by Roff, Perma non slip adhesive by Perma, Sika Tilofix by Sika, etc. are commonly used products for this application. Nowadays special tile adhesives are available in the market, which are used to fix tiles on plywood subfloor. They are polymer-modified cement-based adhesives with some additives added in them. They are available in liquid form and are mixed with non-skid adhesives before application. They have high bonding strength which can be used in vibration prone areas. Roff ply master by Roff, Perma liquid tile adhesive by Perma, Laticrete 73 by MYKLaticrete etc, are commonly used tile adhesives for this application. 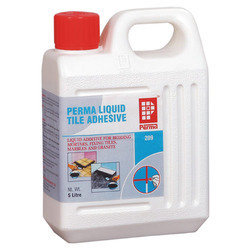 Tile adhesives are usually available in 5 kg to 50 kg bags. Nowadays tile adhesive with improved properties such as rapid setting and no shrinkage are also available in the market. Tile adhesive is applied by using a notched trowel and mixed with clean water to obtain a homogenous paste free of lumps or foreign matter. Tile adhesive is stored in a cool and moisture free atmosphere.